A house under 2000 square feet is considered small; it is the typical minimum house size in a subdivision development. But a small, energy efficient house is easy to heat, cool, clean and maintain. It is not easy to squeeze a spare bedroom, over-sized master bedroom, extra bathrooms, washing machine, dishwasher, an HVAC system, a water heater and storage into a home under 2000 square feet. Consider what is really a necessity and how many well defined spaces you need to create. An open floor-plan helps a small space feel large but it can be difficult because it doesn't always offer the inhabitants enough privacy. There are many energy and space efficient materials available like instant water heaters and boilers that take up a third of the space and a tenth of the energy of their predecessors. As with budgeting the cost of a home; budgeting the use of square footage requires planning. And it requires an understanding of the spaces you need. Identifying how many people occupy a home at various times of year, how the spaces in the home are used, and what is done at home will help in this planning process. Featured here is a 24x36 timber frame with about 1700 square feet of space with two bedrooms, two office nooks and an open plan kitchen dining and living room and lots of storage. It takes approximately two months to gather and prepare all of the materials for the shell of a home this size. Our crew raises a 24x36 timber frame in one day, the panels are installed in another two days. Windows, doors and a metal roof are installed in one more day. We are typically on a house site for four or five days (depending on the weather), building a weather tight shell. A homeowner than has a comfortable, protected, and lock-able environment in which to finish his or her home. In this uncertain economy with high heating costs a small energy efficient home is a joy to own, heat and maintain. A carpenter’s, cook’s, landscapers, artisan’s . . . well, EVERYBODY’S recurring frustration is a tool that fails to cut. For forty years I’ve sharpened on virtually everything, even a concrete sidewalk while trying to mow a lawn I had been dropped off to do with a dull blade! Over the years, a slowly growing income and faster growing knowledge have led to better alternatives: sandpaper pasted to glass, seemingly cheap – but it doesn’t last and it is not too portable since the glass breaks; oil stones from slimy gritty to awkwardly short slimy Arkansas (do you rub the stone on the tool or the tool on the stone? ); Japanese wet stones with honing guides that either ride on the stone and ruin it or guides that ride off the stone and need to be readjusted; diamond stones clogging with invisible rust and costing . . . well, like diamonds. For awhile I tried the flat plate circular electrics – leaving all of my clothes soaked at waist-level and turning all of my tools into skew chisels! Lurking out there was this magical tool, the Tormek, which I refused to buy because it cost so much! When my son joined the business he insisted I grow up and buy the Tormek. It paid for itself in a month! While our crew used to spend hours sharpening their timber framing chisels and slicks, the job is now done in minutes, right on site with very little interruption of work. Combining a 220 grit vertical wheel spinning at just the right speed not to spray water, both the grinding and the conditioning is done in one step instead of two and in a minute instead of forty. The buffing wheel is extraordinary, it puts a razor edge on in seconds. The convenience, speed and accuracy of this tool make my former concentration on short-term savings foolish . . . penny-wise and pound foolish as they say. By spending a little more (a good set of wet stones and guide start at about $250). We have saved thousands in time and labor. The Tormek has also proven far more durable than stones. 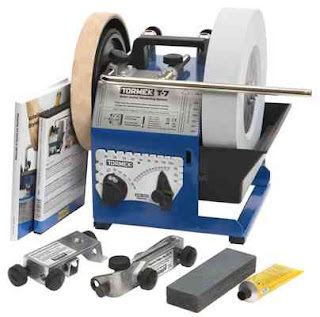 With a long list of accessory guides, virtually every shape can be sharpened on the Tormek. It turns with such a steady fortitude that I find I can usually sharpen things free hand and certainly easily touch up anything! Life is SHARP, life is GOOD!